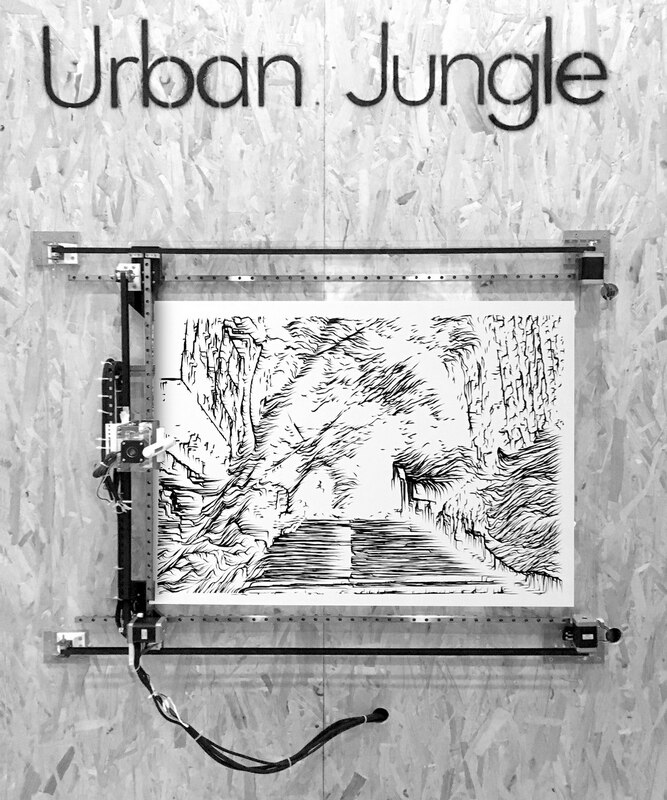 “Urban Jungle” looks at the 200 year long (1850 – 2050) clash between Hong Kong’s natural and concrete jungle through a unique lens that merges traditional Chinese ink painting techniques with algorithmic design tools and low-tech robotics. All drawings are made with ink pencil brushes using specifically designed computer algorithms and the above tailor-made drawing robot. Over the course of weeks the drawing robot will produce a gradually changing mural composition on the left showing the transformation of Hong Kong from 1850 until 2050. The city’s original natural mountain setting of Hong Kong slowly gets buildings added to it until a visionary image of the city in 2050is reached. The original ink drawing sequence on the right illustrates Hong Kong’s current dialogue between natural and concrete jungle through a series of views taken throughout the city. The artwork addresses Hong Kong’s confrontation between the built environment and nature, and visualises the resulting forces that drive the vertical city upwards into its unique high-rise typology. The premise is that both the natural and concrete jungle are organically growing ecologies. The developed drawing style visualises these two systems as ‘alive’ and ‘inter connected’ in a mutually parasitic relationship.